People in Flint still can't drink the water from the tap, but they have to pay for it. Terrence Tyler (R) replaces their old water filter in Flint, Michigan. Rev. Deborah Conrad paused as she was shuffling papers, readying her church for what she expects to be an influx of Flint, Michigan, residents needing help to pay their water bills. "Well, ya," she responds, a bit taken aback. "Basically everyone has had their water shut off. I don't know anyone who doesn't know someone whose water has been shut off." Despite the round of water shutoffs in Flint, thousands of residents could now lose their homes because of unpaid water bills, even though the city's water system has been plagued by dangerous levels of lead and its pipes are still being replaced. The city has sent out letters to about 8,000 residents last month warning them they could face tax liens on their homes for water and sewer bills that are more than six months past due, Al Mooney, of Flint's treasury department, told BuzzFeed News. 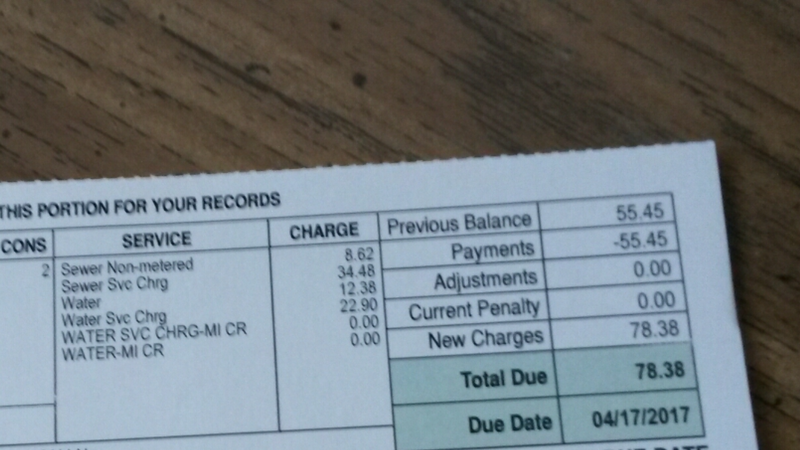 The letters cover two years of overdue bills totaling more than $5 million. Flint officials say people need to pay for the tap water they've been using, despite the fact many still cannot drink it without an approved filter. "These people don't have any money," said Conrad, whose Woodside Church redirected donations for years to help Flint families ensure that they have water. Now, those donations are being used to help residents avoid getting water shutdowns due to unpaid bills. "With this new announcement of tax liens we're back in the fray," she said. Conrad, who still tests her water for lead every week, said she pays about $100 a month for water. She noted that she lives alone and her usage is low, compared to what it would be for a family of three or four—and her account is up to date. 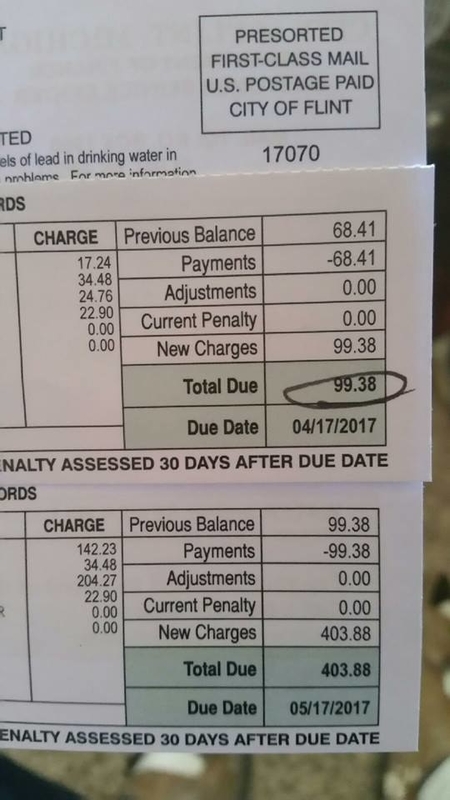 Kim Johnson Cooper wrote in a Facebook thread that her last bill was $120 for a household of three, Kathy Williams chimed in that her monthly water bill is about $90 for her and her husband, and William Hammond said he has a household of four adults and pays between $150-$180 every month. 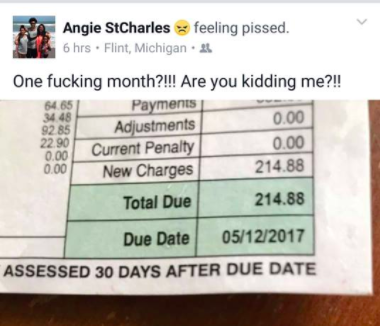 More than 40% of Flint residents live in poverty and the average household makes about $25,000, so dolling out about $100 a month on water and sewer costs is hard to maintain for some already struggling to make ends meet. But the city is also cash-strapped, and struggling to repair its water system. “We are in a tough situation but customers were still using the water for other things like laundry and dishes," Mooney said. "We have to have that money come back." If the 8,000 outstanding water and sewer bills are paid, that would give the city nearly $6 million. Shutoff warnings resulted in payments of about $3 million to the city for overdue water bills last month, and about $2.1 million in March. In a statement, city officials stressed that these notices are for water and sewer charges, which were not affected by the water crisis and "that the process involving the lien transfer to tax bills is routine" and is usually conducted every year. In Michigan, when water is provided to a property, a lien is automatically created. But in a city that's still drinking bottled water and relying on filters over fears of lead contamination, the situation seems egregious. "I must say, I agree with those who have spoken out against this process," Flint Mayor Karen Weaver said in an emailed statement. "I have met with our Interim City Attorney and Finance Director and they say the city is obligated by local ordinance to follow this procedure, and we must follow the law." "I am working to see if any changes or something can be done to help those affected by this, especially given the extraordinary circumstances we have endured due to the water crisis," she added. Weaver also noted that property owners have until February 28, 2018, to pay the tax balance including the outstanding water and sewer charges. After that, the liens will transferred to the county treasurer for collection, which could result in foreclosure. Flint’s water crisis sparked outrage after high levels of lead were found in local children's blood in 2014. Residents, who were paying some of the highest water rates in the country, said the murky, brown water they had been drinking and bathing in caused rashes and made them ill. The federal government declared an emergency in January 2016, and the city has only recently started replacing its lead pipes, more than two years after the crisis began. Thirteen state and local officials have also been criminally charged and class action lawsuits filed against the Environmental Protection Agency and local school districts. Slammed for not protecting its residents, Michigan officials enacted a relief program, doling out $42 million in credits to help cover residents' utility bills dating back to 2014, when the city switched its water source to the local Flint River in an attempt to save money. Officials also gave people a 65% discount on their water use each month. But that program ended in March, despite the fact that at the end of April, nearly 20,000 Flint residences "still had lead and galvanized service lines that need to be replaced," according to the city. Conrad decried Gov. Rick Snyder's decision to end the program, saying that the city still needs support. "They just think poor people are expendable and it's a slap in the face," Conrad said. "Flint will just continue to struggle."